If you have been reading my posts for the past few years, you already know that one of my favorite pass times is spending time outdoors in my garden, and taking pictures of the Beauty of Nature. I love planting veggies and herbs, but also totally adore flowers. 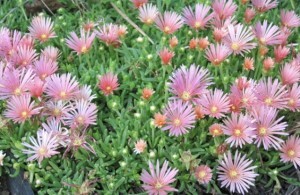 Today I will share some of the pictures I took of few of my currently blooming plants. My East side flower patch, with some of the flowers already blooming, and others are just getting ready do bloom a little later on. 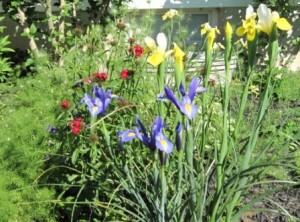 Irises and Sweet Williams loving the sunny weather today. 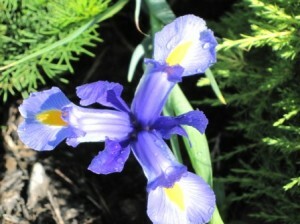 What a natural beauty of an Iris flower. 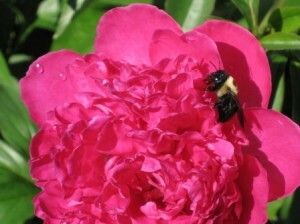 As you can see, I am not the only one enjoying these gorgeous blooms. A perfect place to sit down and relax. My youngest son built this bench, in his late teens, as a Mother’s Day gift to me, so it creates a very special place for me to sit down and relax, surrounded by blooming plants. 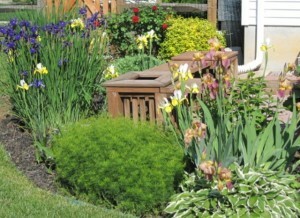 There are also three, corner openings for flower pots, but I usually leave them open. I was very proud of him, since he did a very nice job with his first ever woodworking project (now he is my computer specialist and financial adviser). I am so lucky!! Are you saying – Is this a Poinsettia? – You are correct, this is my Poinsettia…no, I am not growing it outside. 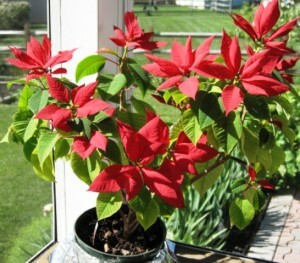 I had to share a picture of this Poinsettia with you, since it is in my care for two years now. If you recall my previous post, I purchased it for Christmas two years ago. I preserved it for a whole year as per the instructions I also posted, and this is how it looks like today. As you can see, it’s still doing very well. Now my challenge is to keep it going for as long as I can, and I will definitely share my progress with you. I am very curious to find out how long this Poinsettia will last, and still keep a descent shape. Did any of you save your Christmas Poinsettias?